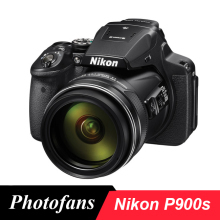 Shoot the moon with the 83x optical zoom COOLPIX P900s Digital Camera from Nikon. The camera has a 16MP CMOS sensor and a built-in lens with a 35mm equivalent focal length of 24-2000mm. For an even further reach, the camera also has 166x Dynamic Fine Zoom, and 332x digital zoom, effectively quadrupling the optical zoom. The P900s features Dual Detect Optical VR, providing up to five stops of compensation, and reducing the appearance of camera shake in your images. A vari-angle TFT LCD screen and an electronic viewfinder allow you to review and compose images, as well as navigate the menus. The camera also shoots full HD 1080p video, has built-in Wi-Fi, NFC, and manual exposure control. Zoom up to 166x with enhanced digital zoom that effectively doubles your reach, or 332x digital zoom for quadruple the optical zoom’s reach. If you lose sight of your subject while zoomed in, press the Snap-Back Zoom button for a quick zoomed-out view. Find your subject again and then release the button to zoom back in. Providing you with two viewing options to choose from, the P900s features a 3″ 921k-dot vari-angle TFT-LCD screen with 6-level brightness adjustment that allows you to monitor and compose shots comfortably from various shooting positions, and a .2″ 921k-dot electronic eye-level viewfinder that allows you to conveniently frame your shot. Nikon snapbridge allows you to control your camera from your smart device through the built-in Wi-Fi. The Wi-Fi and NFC allow you to quickly share photos with family and friends. In addition to high-quality still photographs, the COOLPIX P900s can capture Full HD 1920 x 1080p video at up to 60 fps with a built-in microphone providing stereo audio recordings. Also it has other frames rates and additional modes, such as high speed which records video at up to 120 fps at a reduced resolution. The COOLPIX P900s employs a combination of auto and manual controls such as Programmed Auto, Night Mode, Portrait, and Landscape. For a more hands-on approach, exposure modes include Program Mode, Shutter Priority, Aperture Priority and Manual mode.